Precision Nutrition » Sweet vs. regular potatoes: Which are really healthier? 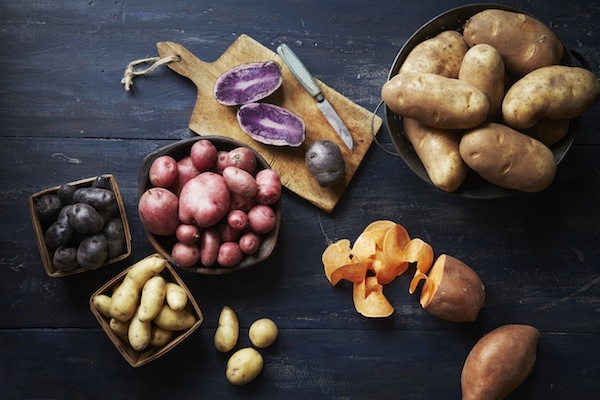 Precision Nutrition » Sweet vs. regular potatoes: Which are really healthier?. The injection of B12 Vitamin into those with lower back pain resulted in less need for pain medication. Low levels of B12 associated with myofascial pain. note: Low levels of zinc are significantly decreased in those with myofascial pain. Effect of diclofenac with B vitamins on the treatment of acute pain originated by lower-limb fracture and surgery. Ponce-Monter HA, Ortiz MI, Garza-Hernández AF, Monroy-Maya R, Soto-Ríos M, Carrillo-Alarcón L, Reyes-García G, Fernández-Martínez E.
Área Académica de Medicina del Instituto de Ciencias de la Salud, Universidad Autónoma del Estado de Hidalgo, 42090 Pachuca, HGO, Mexico. The aim of this study was to compare the efficacy of diclofenac, for the treatment of acute pain originated by lower-limb fracture and surgery, with that of diclofenac plus B vitamins. This was a single-center, prospective, randomized, and double-blinded clinical trial. Patients with lower-limb closed fractures rated their pain on a 10 cm visual analog scale (VAS). Patients were then randomized to receive diclofenac or diclofenac plus B vitamins (thiamine, pyridoxine, and cyanocobalamin) intramuscularly twice daily. Patient evaluations of pain intensity were recorded throughout two periods: twenty-four hours presurgery and twenty-four hours postsurgical. One hundred twenty-two patients completed the study. The subjects’ assessments of limb pain on the VAS showed a significant reduction from baseline values regardless of the treatment group. Diclofenac plus B vitamins combination was more effective to reduce the pain than diclofenac alone. The results showed that the addition of B vitamins to diclofenac increased its analgesic effect. The novelty of this paper consists in that diclofenac and diclofenac plus B vitamins were useful for treatment of acute pain originated by lower-limb fracture and surgery. Eur Rev Med Pharmacol Sci. 2000 May-Jun;4(3):53-8. Vitamin B12 in low back pain: a randomised, double-blind, placebo-controlled study. Mauro GL, Martorana U, Cataldo P, Brancato G, Letizia G.
Clinica Ortopedica e Traumatologica con Fisioterapia e Medicina dello Sport, Università degli Studi di Palermo, Italy. The objective of this double-blind randomised, placebo-controlled study was to examine the efficacy and safety intramuscular vitaminB12 (Tricortin 1000) in the treatment of low back pain in patients with mechanical or irritative lumbago. 60 patients aged between 18 and 65 years with lumbago or sciatic neuritis of mechanical origin without need for surgical procedures were enrolled. Patients had to present with a proven medical history for back pain (lasting from 6 months to 5 years) and a pain intensity [as evaluated with a Visual Analogic Scale (VAS)] equal or greater than 60 mm. Efficacy primary end-point was evaluated by means of a visual analogic scale (VAS) and a Disability Questionnaire (DQ). Consumption of paracetamol during the study period was the secondary efficacy end-point. Both treatment groups experienced a sharp decrease in pain and disability. However, comparison between groups at the end of the treatment period showed a statistically significant difference in favour of the active treatment both for VAS and DQ (p < 0.0001 and p < 0.0002, respectively). Consumption of paracetamol proved significantly higher in the placebo group than in the active treatment (p < 0.0001). The efficacy and safety of parenteral Vitamin B12 in alleviating low back pain and related disability and in decreasing the consumption of paracetamol was confirmed in patients with no signs of nutritional deficiency. Curr Med Res Opin. 2009 Nov;25(11):2589-99. doi: 10.3111/13696990903246911. Diclofenac plus B vitamins versus diclofenac monotherapy in lumbago: the DOLOR study. Mibielli MA, Geller M, Cohen JC, Goldberg SG, Cohen MT, Nunes CP, Oliveira LB, da Fonseca AS. Centro Universitário Serra dos Orgãos (UNIFESO), Rio de Janeiro, Brazil. To assess the influence of vitamins B1, B6 and B12 on the analgesia success achieved by diclofenac in subjects with acute lumbago. A randomised, double blind controlled clinical study in parallel groups, in which subjects received twice-daily oral administration of either the combination therapy, Group DB (50 mg diclofenac plus 50 mg thiamine, 50 mg pyridoxine and 1 mg cyanocobalamin) or diclofenac monotherapy, Group D (50mg diclofenac). The study period lasted a maximum of 7 days. If sufficient pain reduction was achieved (defined as Visual Analogue Scale <20 mm and patient’s satisfaction), subjects could withdraw from the treatment after 3 or 5 days. All subjects gave written informed consent to participate in the study. Main outcome measures: The primary confirmatory study objective was to determine the number of patients with sufficient pain reduction after 3 days of treatment. Three hundred and seventy-two subjects were allocated at random to either treatment group: Group DB – 187 subjects and Group D – 185 subjects. After 3 days of treatment, a statistically significant higher proportion of subjects in Group DB (n = 87; 46.5%) than in Group D (n = 55; 29%) terminated the study due to treatment success (chi(2): 12.06; p = 0.0005). Furthermore, the combination therapy yielded superior results in pain reduction, improvement of mobility and functionality. Drug safety monitoring profile throughout the trial was within the expected safety profile of diclofenac. The combination of diclofenac with B vitamins was superior to diclofenac monotherapy in lumbago relief after 3 days of treatment. As a study drawback, daily VAS measurements were only recorded until subject withdrawal from treatment, whether after 3, 5, or 7 days. There were no differences in safety profile between the two study groups. Klin Wochenschr. 1990 Jan 19;68(2):107-15. [Reduced diclofenac administration by B vitamins: results of a randomized double-blind study with reduced daily doses of diclofenac (75 mg diclofenac versus 75 mg diclofenac plus B vitamins) in acute lumbar vertebral syndromes]. Kuhlwein A, Meyer HJ, Koehler CO. Pain syndromes of the lumbar spine are one of the main problems in orthopedic practice. The therapeutic effect of NSAIDs is not subject to doubt in this connection. But considering that the application of NSAIDs is frequently associated with side effects, a reduction of dosage would be to the patient’s benefit. Clinical studies have shown that concomitant treatment with vitamins B1, B6, B12 and diclofenac leads to a more efficient pain relief than treatment using diclofenac alone and thus provides the possibility of saving NSAIDs. This clinical trial was carried out in order to determine whether these results can also be achieved when a reduced dosage of diclofenac (75 mg daily) is used. 123 patients with acute pain syndromes of the lumbar spine were treated with either B-vitamins and diclofenac or diclofenac alone for a maximum of 7 days. There was the option to terminate therapy in the trial after 3-4 days in the case of total pain relief. 45 patients could stop the treatment due to remission of symptoms. 30 patients belonged to the combination therapy group, the other 15 took diclofenac alone; this difference is statistically significant (p less than 0.05). All parameters concerning pain relief and movement of the vertebral column showed statistically significant differences in favour of the B-vitamin-diclofenac-combination, too. The results document the positive influence of B-vitamins on painful vertebral syndromes and indicate that B-vitamins contribute to saving of NSAIDs by shortening the treatment time and reducing daily NSAID-dosage. [Shortening diclofenac therapy by B vitamins. Results of a randomized double-blind study, diclofenac 50 mg versus diclofenac 50 mg plus B vitamins, in painful spinal diseases with degenerative changes]. Vetter G, Brüggemann G, Lettko M, Schwieger G, Asbach H, Biermann W, Bläsius K, Brinkmann R, Bruns H, Dorn E, et al. The use of nonsteroidal anti-inflammatory drugs (NSAID) such as diclofenac for treatment of degenerative rheumatic disorders of the lumbar spine is of great significance in orthopedic practice. Clinical studies have shown that concomitant treatment with vitamins B1, B6, B12 and diclofenac provides more efficient pain relief than treatment using diclofenac alone. This study was undertaken in order to determine whether the duration of treatment with diclofenac for lower back pain can be shortened by adding B-vitamins to the therapeutic regimen. From September through December of 1986, 256 patients participated in a multicenter, controlled, randomized double-blind trial which compared the clinical efficacy of diclofenac (50 mg) with a combined therapy of diclofenac (50 mg) and vitamins B1, B6, and B12 (thiamine nitrate, pyridoxine hydrochloride, and cyanocobalamine, resp. ; in dosages of 50 mg, 50 mg, and 0.25 mg, resp.). Patients were treated with 3 X 1 capsule daily for a maximum of two weeks, having the option to terminate participation in the trial after 1 week in the event of total pain relief. The data of 238 patients were able to be included in the evaluation. 29 patients opted to discontinue therapy due to remission on symptoms. Nineteen (65.6%) of these patients belonged to the combined therapy group, the other 10 (34.4%) having taken diclofenac alone; this difference is statistically significant (p less than 0.05). An important aspect in the evaluation of therapy was the patient response regarding the improvement of painful symptoms which, in addition to their subjective feedback, was reflected in the test results of the “Hoppe Pain Questionnaire (HPQ).” All parameters used as a measure of pain relief indicated superior results with the B-vitamin supplemented therapy when compared with results obtained with diclofenac alone. Moreover, after 3 days of therapy the “sensory”pain factor “sharpness” improved significantly. Undesirable side-effects were documented with 39 patients, 14 of them having discontinued therapy for this reason. No statistically significant difference could be determined within this group with regard to therapy. The study results document the positive influence of B-vitamins on painful symptoms and indicate that less NSAID is needed for pain relief when combined with B-vitamins. Klin Wochenschr. 1990 Jan 19;68(2):116-20. [Results of a double-blind study of diclofenac + vitamin B1, B6, B12 versus diclofenac in patients with acute pain of the lumbar vertebrae. A multicenter study]. Brüggemann G, Koehler CO, Koch EM. Several clinical trials have shown that the duration of treatment of painful vertebral syndromes can be shortened by using a combination of vitamins B1, B6, B12 and diclofenac instead of diclofenac. In addition, a more efficient pain relief could be achieved by the combination therapy. In order to confirm these results, we compared the clinical efficacy of diclofenac (25 mg) and a combination preparation with diclofenac (25 mg) plus vitamins B1 (thiamine nitrate 50 mg), B6 (pyridoxine hydrochloride 50 mg) and B12 (cyanocobalamin 0.25 mg) in a multicentric randomized double-blind study including 418 patients. All patients received 3 x 2 capsules daily for a maximum of 2 weeks. In case of total pain relief, therapy should be discontinued after one week. Data of 376 patients could be evaluated. 53 out of 184 patients receiving the combination and 48 out of 192 patients treated with diclofenac alone could stop therapy due to sufficient pain relief after one week. The evaluation of the “Hoppe Pain Questionnaire” and the data concerning pain intensity also revealed better results for the combination preparation. The differences in favour of the B-vitamin-diclofenac-combination were statistically significant in patients with severe pain at the beginning of therapy. Considering undesirable side-effects (symptoms in 70 out of 418 patients) there were no significant differences between the two medications. This clinical trial provides further evidence that the combination therapy with diclofenac plus B-vitamins is more effective than diclofenac alone for the treatment of painful vertebral syndromes. Singapore Med J. 2011 Dec;52(12):868-73. The efficacy and safety of intramuscular injections of methylcobalamin in patients with chronic nonspecific low back pain: a randomised controlled trial. Chiu CK, Low TH, Tey YS, Singh VA, Shong HK. Chronic, nonspecific low back pain is a difficult ailment to treat and poses an economic burden in terms of medical expenses and productivity loss. The aim of this study was to determine the efficacy and safety of intramuscular metylcobalamin in the treatment of chronic nonspecific low back pain. This was a double-blinded, randomised, controlled experimental study. 60 patients were assigned to either the methylcobalamin group or the placebo group. The former received intramuscular injections of 500 mcg parenteral methylcobalamin in 1 ml solution three times a week for two weeks, and the placebo group received 1 ml normal saline. Patients were assessed with Oswestry Disability Index questionnaire Version 2.0 and Visual Analogue Scale pain score. They were scored before commencement of the injections and at two months interval. Of the 60 patients, 27 received the placebo injections and 33 were given methylcobalamin injections. A total of 58 patients were available for review at two months (placebo: n is 26; methylcobalamin: n is 32). There was a significant improvement in the Oswestry Disability Index and Visual Analogue Scale pain scores in the methylcobalamin group as compared with the placebo group (p-value less than 0.05). Only minor adverse reactions such as pain and haematoma at the injection sites were reported by some patients. Intramuscular methylcobalamin is both an effective and safe method of treatment for patients with nonspecific low back pain, both singly or in combination with other forms of treatment. The relationship between serum trace elements, vitamin B12, folic acid and clinical parameters in patients with myofascial pain syndrome. Okumus M, Ceceli E, Tuncay F, Kocaoglu S, Palulu N, Yorgancioglu ZR. Myofascial pain syndrome (MPS) is characterized by myofascial trigger points in a palpable taut band of skeletal muscle. We aimed to investigate serum trace elements, vitamin B12, folic acid levels and their correlations with clinical findings and functional status in patients with MPS. Thirty eight patients with at least one trigger point located on shoulder muscles, and at least 6 months duration, were included in this study. The demographic data, disease duration of patients were noted. Serum copper, zinc, magnesium and iron levels, vitamin B12 and folic acid levels were measured. Visual analogue scale (VAS) was implemented to estimate daily severity of pain. Pain pressure threshold of subjects and control groups were assessed by using Fischer’s tissue compliancemeter. The Turkish version of the Beck Depression Inventory (BDI) was administered for the presence of any depressive disorder. The mean age of patients in MPS group and control group were 33.1 and 37.8 years respectively. Serum levels of zinc (p< 0.006) were significantly decreased in patients with MPS. VAS, total myalgic and BDI scores of patients were significantly higher than the control group (Respectively p< 0.000, p< 0.012, p< 0.000). Association between TMS and magnesium, vitamin B12 levels was found statistically significant. BDI score correlated significantly with the serum zinc level (r:-0.548, p< 0.001) and VAS in patients with MPS (r:0.641, p< 0.000). According to the results of this study, it was asserted that trace elements, vitamins may play an important role in the pathophysiology of MPS and psychological factors may also have additional effect. It might be rough trying to eat enough fibre in your diet but it is a must. Fibre is a non-digestible substance. Despite it being non-digestible and that it does not contribute to your vitamin, mineral, protein, fat or carbohydrate consumption its benefits are numerous. There are two forms of fibre, soluble and insoluble, which we will discuss here. Maintains optimal acidity in the intestines preventing microbes from producing cancerous substances. Slows uptake of sugars thus regulating blood sugar levels which helps those with diabetes and those preventing type II diabetes. As you can see, all of those healthy foods your mom told you that you needed to eat contain fibre. These foods are not just good for fibre but also for important vitamins and minerals. The Canada food guide recommends that you consume 7 to 10 servings of fruits and vegetables a day. Look to consume 25 to 35g of fibre a day. Do not increase your fibre consumption quickly because it may cause Gas, diarrhea, general abdominal discomfort, constipation, possible blockages, or the need for urgent movements. In addition, you will have to increase your water consumption because fibre absorbs water. Don’t focus on a particular fibre type. Both are very important for your health. Instead, make choices when you are deciding on what you eat. Choose a food that is higher in fibre instead of one that is devoid of fibre. 4. Omega 3’s are anti-inflammatory, they reduce pain, reduce the formation of fibrosis, protects the cardiovascular system, lessens the effects of stroke and heart attack, and reduce triglycerides. 5. Omega 6’s cause inflammation. 6. Omega 6’s are found in corn, peanut, sunflower, safflower, soy, meat, eggs, and dairy. 7. Ideal ratio between Omega 6’s and Omega 3’s is 4:1. The Western diet’s ratio is about greater than 10:1. 8. For cardiovascular benefits you should consume more than 850mg/day to 2.7g/day. This is likely only possible with supplementation. EPA, DHA, Omega 3’s, Omega 6’s, PUFAs, essential fatty acids, fish oils, flax seed oils… Everyone seems to be talking about these things but what are they, and do you really need them!? If you are concerned about your overall health then the answer is yes. As you will learn here, omega 3 fatty acids are crucial to your overall health. In our highly processed food society this is a fatty acid that is missing from out diet and may be the answer to many people who are suffering from, or trying to prevent, some of the top diseases in our society. Where do we get them from? Omega 3’s can be consumed by eating plant sources (flax, hemp, walnuts) or animal sources (cold water fatty fish, or algae). Plant sources typically come in the form of alpha-linoleic acid which the body can convert to EPA. The draw back to plant sources is that they do not convert very effectively to EPA. Animal sources come in the form of EPA or DHA and thus are a better source, except these sources are at risk for being contaminated with toxins such as mercury. Therefore to get adequate amounts of these essential fatty acids you will likely have to consume supplements. 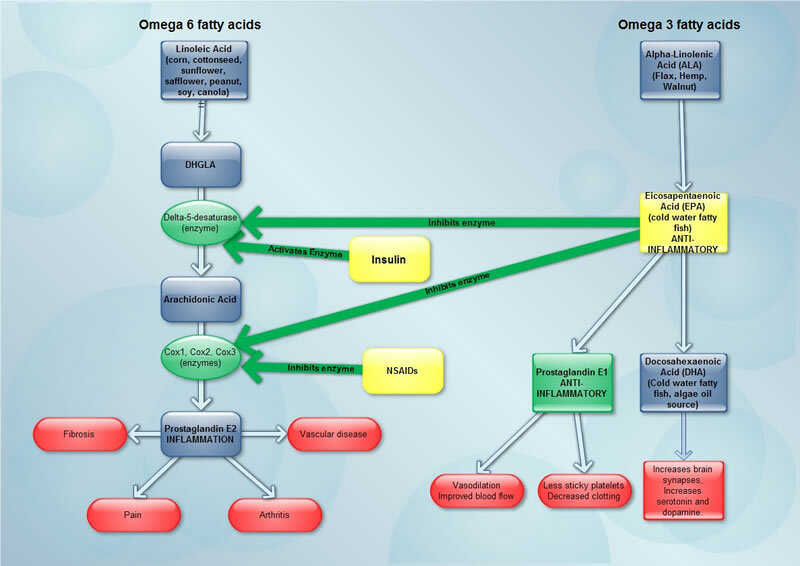 If you take a look at the diagram here you will see how Omega 3’s affect the body. DHA is responsible for forming the synapses in the brain. This is why you see in DHA fortified baby formula. EPA has two functions. One is that it forms a substance called Prostaglandin E3 (PGE3) which has anti-inflammatory effects. It is also responsible for decreasing the platelets’ ability in your blood to form clots by making them less sticky. This may explain why those having a stroke may have less detrimental outcomes if they were consuming sufficient amounts of Omega 3s. The degree of damage post heart attack has been less in those who consume more EPA. Omega 3s are also responsible in improving blood flow by dilating or opening up the blood vessels. This likely explains the reduction in blood pressure after consumption of Omega 3’s. Another extremely important part of EPA is that it slows down the activity of the enzyme delta-5-desaturase (D-5-D). D-5-D is important in converting an Omega 6 fatty acid called linoleic acid (found in safflower oil, sunflower, soy, peanut and canola) to arachidonic acid which ultimately produces prostaglandin E2 (PGE2). PGE2 promotes inflammation in the body. Research is starting to see that inflammation is associated with many health issues such as arthritis, cardiovascular disease, pain, and fibrosis. EPA also blocks the conversion of arachidonic acid to PGE2 thus they directly lessen the effect of high consumption of arachidonic acid (found in meat, eggs, dairy) and linoleic acid. Athletes who perform high intensity cause inflammation and this inflammation is compounded by the western diet of high levels of omega-6 fatty acids. This can likely be counteracted by consuming Omega 3 fatty acids. One study found that 59% of those with neck and back pain, due to a herniated disc, were able to discontinue their use of NSAIDs after consuming fish oil for on average 75 days. Non steroidal anti-inflammatory drugs (NSAIDS) also block the production of PGE2 to decrease pain and inflammation but they have side effects such as gastric ulcers/bleeding, nausea, vomiting, diarrhea, kidney impairment, and hypertension. It should also be noted in the diagram that insulin increases the production PGE2. We see an increase in insulin in people who have type 2 diabetes and those who consume large amounts of simple sugars and high fructose corn syrup. In this day and age of processed foods, which are full of simple sugars and high fructose corn syrup, it is no wonder that more and more people are experiencing diseases which are related to inflammation. Research has also shown that Omega 3s successfully decreases your triglycerides (25-30%), but not LDL (the bad cholesterol), more successfully than by medication. There have also been studies that have shown a reduced risk of sudden cardiac death. In the past it was estimated that the ratio between Omega 6 and Omega 3 was about 1 to 1. Right now it is estimated that the ratio is about 10:1 to 15:1. People are consuming large amounts of Omega 6s from linoleic acid and arachadonic acid. The sharp rise in vegetable oil consumption may be to blame. In 1909 the consuption per person of vegetable oil was 2lbs and in 1985 the consumption was up to 25lbs. No wonder people are experiencing health issues associated with inflammation! Canada recommends the ratio to be 4:1. There are two ways you can improve your ratio. 1. Eat foods containing omega 6s in moderation by substituting foods high in linoleic acid and arachidonic acid with foods high in ALA or foods high in EPA. 2. Supplement your present diet with fish oils. Make sure to consult your doctor, chiropractor or health care provider before doing so. It is recommended that the minimum amount of EPA/DHA should be 0.3 to 0.5g/day and 0.8 to 1.1g/day of ALA. To see benefits in cardiovascular health and anti-inflammatory effects research has shown that you should consume greater than 850mg/day to 2.7 g/day. Consumption of fish oil below 3g/day has been considered safe but the Inuit have been shown to consume up to 16g/day. 1. Person without documented coronary heart disease (CHD) – Eat a cariety of (prefereably oily) fish at least twice a week. Include oils and foods rich in alpha-linolenic acid. 3. Persons needing triglyceride lowering – 2-4 grams of EPA/DHA per day provided as capsules under a physicians care. Since EPA/DHA are essential for our health and because our society consumes an unhealthy balance between Omega 3’s and Omega 6’s which leans use towards inflammation choosing foods that are high in Omega 3’s,reducing the consumption of foods high in Omega 6’s, and considering EPA/DHA supplements is highly recommended. The following information should not be used as physician advice and is only used for educational purposes. For further information please consult your physician. 1. Boswell, M & Cole, BE. Weiner’s pain management: A practical guide for clinicians. 7th ed. American Academy of Pain Management, 2006, pp 584-585. 2. Fact Sheet. Fish oils and Omega 3 fatty acids. CMAJ, 2008 : 178(2). 3. Holub, BJ. Clinical nutrition: 4. 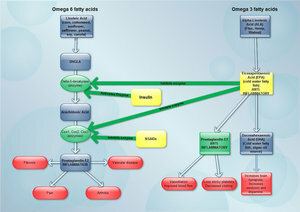 Omega-3 fatty acids in cardiovascular care. JAMC, 2002; 166 (5). 4. Kris-Etherton, PM, Harris, WS, Appel LJ. Fish Consumption, Fish Oil, Omega-3 Fatty Acids, and Cardiovascular Disease. Available at: http://circ.ahajournals.org/cgi/content/full/106/21/2747 . Accessed February 20, 2009. 5. Marcholi R et al. GISSI-Prevenzione Investigators. Early protection against sudden death by n-3 polyunsaturated fatty acids after myocardiaol infarction: time=course analysis of the results of the Gruppo Italiano per lo Studio della Sopravvivenza nell’Infarto Miocardico (gissi)-Prevensione. Circulation. 2002;105(16): 1897-903. 6. Maroon, JC & Bost, JW. Omega-3 fatty acids (fish oil) as an anti-inflammatory: an alternative to nonsteroidal anti-inflammatory durgs for discogenic pain. Surgical Neurology, 2006 (65): 326-331. 7. von Schacky, C. A review of omega-3 ethyl esters for cardiovascular prevention and treatment of increased blood triglyceride levels. Vascular Health and Risk Management 2006:2(3) 251–262. I treat a number of running athletes ranging from recreational runners to competitive tri-athletes/marathoners. Often I am treating them for repetitive strain injuries. Many of these runners are female. I can often explain their injuries due to poor running mechanics, muscular imbalances, previous injuries, volume of training etc. Often I can successfully treat them using Active Release Techniques, acupuncture, manipulation and appropriate stretches or corrective exercises but sometimes they just keep getting injured throughout their training season. What is causing this? Energy availability between 20–30 kcal/kgFFM/d has been found to impair bone formation due to a sharp decline in the osteocalcin. This increases the chance of stress fractures. 2 previous studies have found an association between fat intake and stress fractures. A study that followed elite adolescent runners for a period of 3 years found that mean energy intake and fat intake decreased over the follow-up period while stress fracture incidence increased. In the study they found that the foot/ankle the most common site (40 % of injuries), followed by the knee (19 %) and the hip (16 %). Stress fractures/stress reactions, iliotibial band problems, and tendonitis were the most common injuries. Using daily fat intake they were successfully able to classify 64% of the subjects as subsequently injured (1) or not injured. The odds ratios revealed that runners consuming less than the commonly recommended 30% of total calories from fat were 2.5 times as likely to sustain an injury compared with runners consuming 30% or more. This is a very enlightening research study. It may explain why I see many of my clients having re-occurring injuries. So if you are a female runner, and you get injured often, one possible ways of preventing injury is to analyze your diet. Are you getting enough healthy fats in your diet? Are you getting around 30% of your calories from fat?